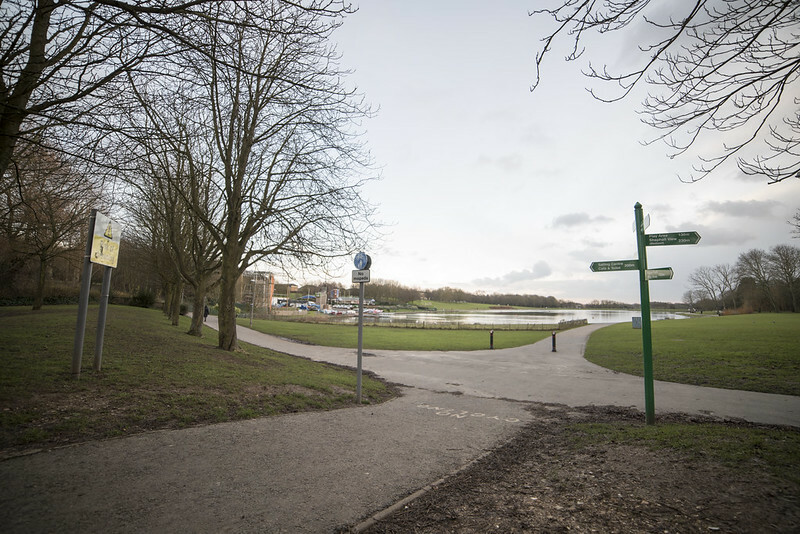 16.01.15, London – Samyang 14mm F2.8 ED AS IF UMC Ultra Wide Angle Lens on the Nikon FX Mount. After using 24-70 F2.8mm and going wide with 20mm F2.8 I wanted to go even wider to the widest possible and that was pushing me to the 14mm. I didn’t have the budget neither a wish to put that much into a lens which would not see the light of the day in regular use and not be used extensively to be given a price of a Nikon ultra wides. I decided to move off the Nikon to give myself a chance to try something different. With the valid reasons that ultra wide justifies you more in the travel scenarios and ultra wide scenarios which works awesome on the big MegaPixels guzzlers like Nikon D800\D800E\D810. I took a jump and ordered the new Samyang 14mm F2.8 via Amazon UK and it was sharp for a normal delivery cycle. Second day on the Free delivery is a good service. It didn’t put a hole in my savings as it was moderately priced for a wide angle F2.8. It is nearly 1/5th price of a Nikon F2.8. I will not call it a downside if you are using manual on such wide angle as you are possibly not going to do action shots that requires you to sharp focus on the moving objects. I have grown up through the ages as a child using the manual focus lenses and it doesn’t stops me from going back to Manual focus again. It is a old school thought but in all honesty that price makes me have a kick and put it to the test. On the first impressions, out of the box – It is a very good quality light and solidly put together lens. The petal hood is plastic but well covered in its shell to avoid any damages to the lens. I do love the way you feel when you hold it. Here is the small unboxing video of it. In terms of sharpness and quality of the images – there is indeed a flaw around the lines. You do not get the same straight lines but that is the case in all the ultra wide angle lenses. Here is the sample image at F2.8 without any editting and straight from the sensor of 36mpx D810. Original Image from the Samyang 14mm F2.8 – Unedited mounted on the Nikon D810 at ISO 100. Handheld. With low to medium light I do not find this lens to be any problems with Fringing. I would certainly see a different aspect when I would have to test this in the sunny day against the fringing. There is a slight moderation with edges that they are not sharp as you would expect them to be but if you look in the image above in its full resoltion I do not find this to be an issue in my perspective. Also the FX sensors offers huge potential to crop your image to the likings. Looking at the sharpness perspective if you look at the sign posts – there lines and the sharpness of the text is as clear as you would like it to be. The lens weighs in at 530gms for Nikon mount. Canon mount is 552gms. In terms of using this lens for video\Cine use there is another version which is similar or actually less than the price of the photo lens and the difference is in the focus ring on cine is different and it is measured in T points instead of F point. Happy to answer any questions you may have and feel free to share the article and give me thumbs up if you liked the video or needs any additional inputs. All these years riding in winters and yet knowing that I do not like the cold fingertips I was on the hunt for the heated gloves. There are lot of options to choose from at first and too many questions as each seller has its own selling point. A lot of time spend finding out the real good ones as these all heated gloves are well over £150 mark in general. First few brands that come to the mind are GERBINGS, KEIS, EXO2, WEISE(latest), ALPINESTARS and few others (I possibly don’t know of). I had my own limitations in terms of what I want – as I wear a HG leathers jacket which has a zipper and cuff that is not too big to take any wide cuffs from the gloves inside it yet close it perfectly fine for riding in rains. I wanted something that would slip inside my jacket at the same time. I was surprised that none of the glove makers think of this thought that biker would want to avoid the water coming down the gloves and letting that water get inside of your gloves. Really a shame as that was my biggest deciding factor. I headed to the Infinity Motorcycles store, Hanger Lane as I wanted to be 100% sure before investing into something that I would regret later. Jack was kind and courteous enough to explain me the inner workings of these gloves and which one would suit me as I was cutting down on my options as I was sure that I do not want any glove going over my jacket instead it needs to go under the cuffs. 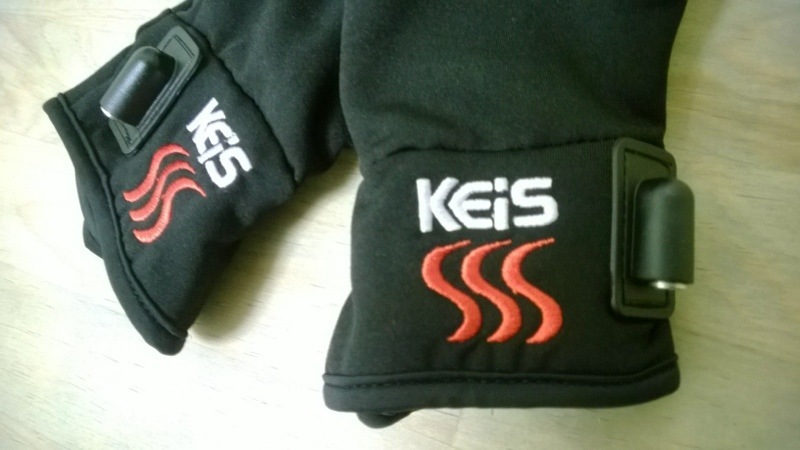 Coming to the point where nothing really fits to what I wanted KEIS inner gloves at £59.99 was the only thing I could think of. I would say, a bit of limitation but yet that is all I could get. I was offered a external charger at £59.99 if I want these inner gloves to be operated separately without fitting them into the battery but it would have proved too costly in real essence of it. 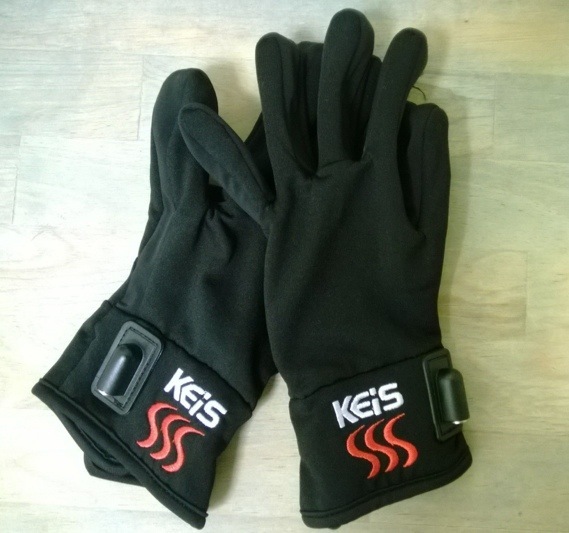 Most other products from the KEIS gloves range have heated element on the top end near knuckles. This was the only pair that has heated element on the fingers as that is what I actually need instead of heated upper knuckles or upper part of the hand. Now, after the first day of its usage I can officially tell you the good, the bad and the ugly about it in practical scenario. My ride to work is about 100miles and just under two hours in the early morning rush hour on the variable tarmac conditions from country roads, Motorway riding and city traffic. 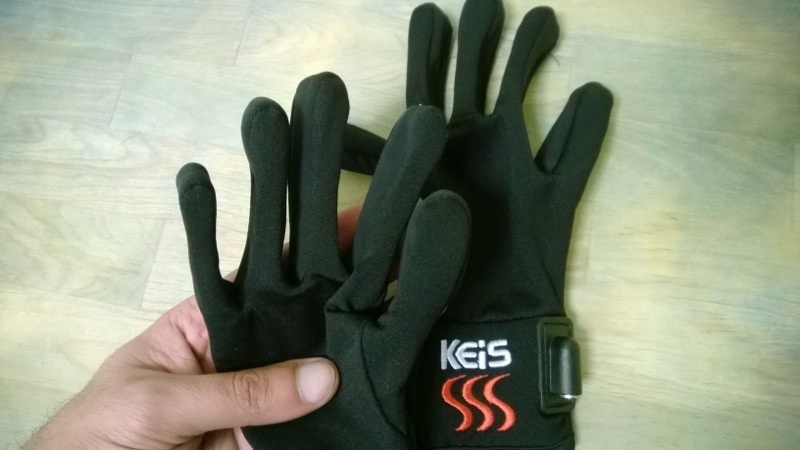 Fitting/getting into one : Ok, all said – these are not the thinnest of the inner gloves you would think of. If you have got the thick fingers be ready to check these with your ideal over gloves. I have decided to use them with the lobster kind of over gloves as my HG normal finger leather gloves are too tight and very uncomfortable to wear these inside. I also bought SPADA Eighty 2 Lobster kind of gloves along with these to enjoy the toasty fingers. I later ending up ordering HALVARSSONS JOX Gloves as the SPADA length was issue fitting it inside my leather cuffs again. Fitting wise these would take one to either getting used to feeling comfortable or ordering a different type of over gloves. I found it quite annoying joining these to the power supply coming from the battery when wearing lobster kind of gloves. Heating/Comfort : Alright, here comes the good part – you would have your fingers feeling toasty within first 2minutes and you would feel quite good warmth getting generated around your fingers. Lovely to feel the warmth but soon you would know that this will get to the point where you may want to stop it from heating but there is no kill switch. Either you take the heat as it comes or remove it from the power supply. There is no science around these very basic gloves but when on the move you would realise they just maintain the equilibrium for the fingers when on the motorway as the wind-chill factor eventually pushes the limits of real testing. These do come out quite good on the motorways and full marks on the heating elements in it. You can use these gloves for hiking in snow or even cold climates if you shell more £’s for external battery that can last for couple of hours as the selling peeps say. Price : These are towards the higher end of pricing but then it does offer what you want out of it. I would possibly add to this blog when I have thoroughly tested these to the use . I do feel these are expensive as anything under £50 would have made these hot sellers for all the winter riders. Just a tenner over £50 and it kills the general riders approach to it. Alternatives : WEISE Montana Heated Gloves @ £199.99 but they would keep you full on blast warm and the comfort wise too good for what they offer. 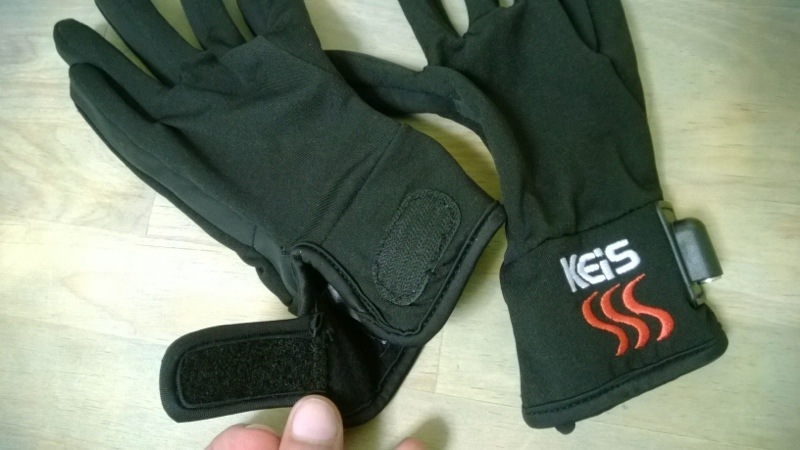 I did not find KEIS fully heated gloves to the price they are selling them for – they seem pretty normal for the price you would not want to pay for them. Alpinestars heated gloves are fairly out of stock on most online and in-stores so they do not have niche market in real scenarios for them. Bottomline: If you can afford these for few winter rides you accomplish then go for these without a doubt. You will struggle for first few times getting used to them but once you find the right comfort with them – these will keep your finger frostbites as things of the past. Feel free to ask if any questions. At first it took a lot of time to make a decision between a DELL, LENOVO and HP. Not forgetting the fact that APPLE is also a contender but never in a real race because of their over priced tags which to my opinion are just good for showoff when the same tasks can be done in a better faster way on lower priced machines. For my everyday needs I have a Lenovo T410 and an old Intel duo core 1.3Ghz Dell machine. I wanted something which will run my Adobe suite without crashing and running out of memory all the time. I must also search for a machine that is not going to put a hole in my pocket beyond my budget restraints. I started looking at Intel new range core i7 but they are simply not fitting in my budget and the call now is only between i5 and i3 cores. After searching online for days, weeks I was waiting for an opurtunity to find a perfect deal. An average i5 and i3 processor on a laptop would differ between £80-150 straight away along with ram option of 4gb or 6gb. It is obvious to pay that price for performance but paying beyond my needs and my budget will not be my kind of thing. Being a technical guy with an IT profession it makes sense to know my exact needs. My other two laptops would unfold to go on ebay or possible one of the direct reselling shops(Xe, currency converter). I know I would still get about £250 odd from previous laptops considering they both have good working condition along with a hefty 4gb Ram in both the laptops. Eventually after all the search and details of looking for perfect configuration at a good price I found what I was looking for. An i5 processor turbo charged 3.2Ghz with 6GB RAM, 1GB graphic card on board, 750GB HDD, HDMI port and all the little nibbles to satisfy my needs for a decent price under £400. Now that is what I call a deal, the only thing is I wont be getting any of the extras in this case. It would be a non OEM packed box with a one year warranty, no OEM discs and no Recovery discs which completes all my tick boxes. As I never ever needed those useless recovery discs since I prefer to configure my HDD partitions to my own needs. It took me 8 working days after I placed my order online on PCworld website. At first it seemed to be a challenge waiting but in the end it was worth the wait. I got the laptop which arrived in the same state as I would expect to see it in the shop. Just that it was not in its original HP box but that anyways would be going in the bin so who needs to have that. Accessories only included the battery pack and the charger cable with the wall mount socket for charging. Ergonomics wise, the keyboard is spacious to use for longer keystrokes without much of strain on your fingers. If you are annoyed with the DELL touchpad this will be a relief as you can enjoy the comfort of not losing your work each time your finger or hand swipes over the touchpad. Lenovo has a better touchpad but I would be satisfied with this since I use an external Logitech wireless K360 keyboard. Speaker performance is better than any other that you will get closer to in this section. HP Pavilion series comes with Altec Lansing speakers. That no doubt offers you crystal clear sound with additional options to adjust the bass and the treble if you are keen on the music preferences to your ears. You would be amazed even further if you have got a good set of headphones the quality is unbelievably worth tuning into and something hard to get away from. On the other hand, you would want to know about the Sound surround features that are marked on the left hand bottom panel showing SRS premier sound. It does justify for the quality that you can expect for which you would have paid a good amount already. It sure is anyday a DELL and LENOVO beating machine on the sound output quality in this range. For ease of connectivity to your other devices this is a well equipped machine. You would get 3 USB slots with two on one side, 1 HDMI port, 1 VGA port, 1 Ethernet Network Port, 1 each headphone and microphone standard jack along with a SD/MMC card reader that serves all the left side of the bottom panel on this HP Pavilion G6 series laptop. Modern devices all need good and long life powerful batteries. This laptop comes with Li-ion cell battery to give you a good performance of upto3.5hrs easily and then showing last 15% remaining which I would say is second best in the market next to LENOVOs. No one comes next to beating the battery life of Lenovo laptops. Out of everyday use you will see that it does not really faint away like most others especially common in Dell. The power charger for this laptop is on the right side unlike those of the Lenovos and Dell which are on the back and on the left side. On the right side bottom panel you will also find the locking bay, third USB port, a display for charger plugged in and a CD\DVD tray. I personally did not opt for the Blu-ray model as I see it further away from my everyday use. For this price you cannot get any other laptop in this range to satisfy all your needs. I would recommend this machine to anyone who wants to work on something good on faster processing power, longer battery life and excellent sound quality. As of all the things there are always something that you feel is not right and that one thing which does not fit this criteria in this laptop is the display. It is reflective panel so if you are sitting in a bright source of light you will expect to see your own reflection in the screen more often than the text or your visuals on the screen. Again, for this price this is an excellent product but I would again recommend anyone buying this product in its entirety of quality and value for money.